Aqua Health Pool Service Las Vegas is a service company committed to bringing full customer satisfaction. We have over 14 years of experience performing pool and spa maintenance. We are a family operated business that is aware of the pool and spa owners’ needs and concerns. We know that besides the wish for a crystal clear pool, our customers want a healthy and enjoyable environment for their families. Pool service, pool cleaning, pool maintenance, automated control systems, acid wash, chlorine wash, tile cleaning, and water treatments. 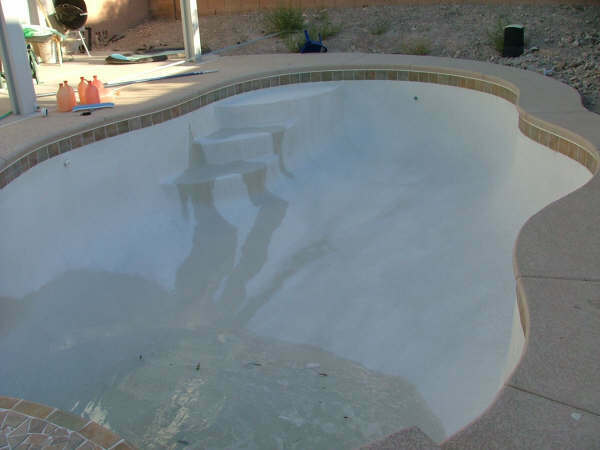 Pool maintenance is probably the most important investment you will make after building your pool in Las Vegas. A periodic pool service not only extends the life of your pool but it also prevents health issues related to the quality of the water. An expert water treatment plus continual professional cleaning assures your family indefinite hours of healthy fun. Every piece of equipment in the operation of your pool is also very important. This is why we care for your pool and pool equipment as a whole. Check and adjust water chemistry. Skim pool surface, vacuum pool bottom, brush pool walls. Empty skimmers and pump baskets. Check and inspect pool equipment. In time, calcium build-up will appear on your tile, hiding the patterns and showing a white irregular stripe all along the waterline. When this happens it is time to perform a “TILE CLEANING.” Many methods are used to remove the build-up, but the one that is highly recommended is the “Pressure Glass Bead.” This method will remove all calcium and demands less hours of work without deteriorating your tile. • Super Stain-Out treatment (a chelating agent to neutralize metals from the water such as magnesium, iron and copper in pool water to remove and prevent stains). • Three (3) days of brush-vaccum. • Maintain the proper chemical levels. • Add conditioner or stabilizer. • Check that all the equipment is running smoothly. • Give your customer a free month of pool service. We seek out a partner-like, long term relationship with high-quality pool builders. For more information, please fill out the form below and we will get back to you once we've had a chance to review your inquiry. Our office is located in the city of Henderson, Nevada but we also serve the South and West and North West Las Vegas areas. We look forward to having the opportunity of keeping your pool as clean and healthy as you want. Thanks in advance for your interest in AquaHealth Pool Service!! Aqua Health Pool Service Las Vegas. Committed to bringing full customer satisfaction. Over 14 years of experience.